Another abundant reef fish that can be caught at the reef edges, They are called Cavali in Trinidad and Tobago. Very strong fighter on light taclke, the Cavali can get to weights of over 50 pounds in these waters. A shoaling fish that travels in numbers. Though it is eaten throughout the islands it is not considered a top quality fish, the flesh is brownish in color and a bit grainy, nonetheless, when freshly caught they are typically used in fish broth. A very popular fish soup made with fresh vegetables and fish on Tobago. The Black Grouper can be caught on shallow reefs around Tobago. They live and feed near the bottom, as a result, they are typically caught on deep diving lures and down rigger baits. They can exceed weights of 60 pounds. Anglers should keep a steady preassure on the Black Grouper to keep them from swimming into their laire. Once they have made it back into their underwater caves it is almost impossible to get them out. This is an excellent eating fish baked , grilled or in fish broth. Terror of the reef. Barracuda can reach lengths of over 7 feet and weigh up to 100 pounds. They are toothy predators that can cut a large fish in half in a quick single strike. Barracuda are abundant around the reefs of Tobago and provide a short but acrobatic fight. Excellent eating fish, in fact It is considered by many as the best tasting fish that are caught off Tobago. In the Northern Caribbean they can contain a toxin known as cigutera which can be very harmful to humans, however, cigutera does not exist south of Martinique making the Barracuda a safe and tasty table fare here on Tobago. Mutton snapper are usually caught while trolling over shallow reefs around Tobago they can also be caught Jigging and with strip baits at depths from as shallow as 3 feet down to 300 feet. 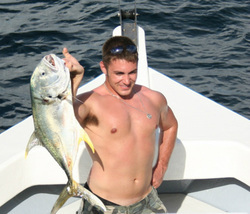 These fish can exceed 30 pounds, however, a 20 npounder is considered a trophy size here on Tobago. They are excellent eating fish and is best served when Baked or slow Grilled in foil with marinade.